You know you should be spending more time investing in developing your firm’s IP but it always feels like such hard work. 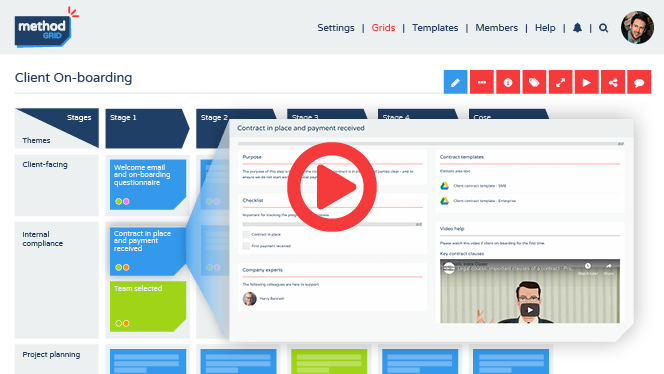 Method Grid makes the process graphical, collaborative and super-easy to follow - allowing you to build out your firm’s methods in small, incremental steps. Intellectual Property (IP) is one of the most important assets that a business can build. With a Method Grid platform in place you enable the incremental growth of your IP capital as an everyday, whole-firm endeavour. One of the biggest challenges a large organization faces is that of getting everyone to work to a common standard. Building a reputation for excellence involves, first and foremost, delivering services to a consistent quality. Method Grid provides this easy-to-use, continuously-improving, centralised point of reference. To enhance productivity, firms need to work smarter. The increase in remote working has led to an increase in the need for on-demand information. 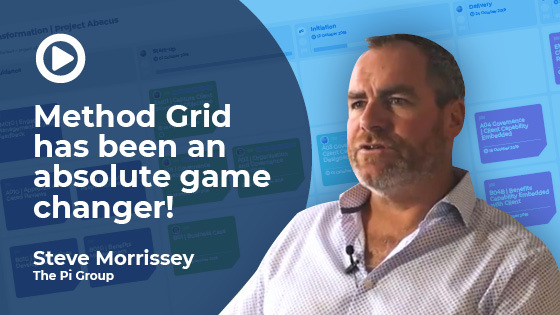 That’s where Method Grid comes in; providing a central place for your staff to build, share and continuously-improve their operating playbook in a collaborative environment, available anytime, anywhere. We have found Method Grid to be an invaluable tool in the development of our internal Plan of Work. It has really helped to formulate and order our thoughts into a usable and easily accessible structure. Method Grid is not just your home for repeatable best-practice; it also enables your staff to track their way through engagement delivery - step-by-step - with easy-to-use checklists. Via graphical progress drill downs, managers can easily track and support such delivery progress across the organization. Method Grid has been a real game changer for us at Footdown. For years we struggled to find a common way of keeping everyone on the same page, following a process and ensuring all information was in the right place and easy to update. Method Grid has taken all that pain away and better still within as little as a couple of hours we had our first grids built, our data in it and people actively using it. Its simplicity makes it a must have for any business these days, I couldn’t recommend it highly enough. Method Grid has been designed not just as a solution for building methodology but also for facilitating best-practice knowledge-management in your organization. With expert-tagging, staff members can quickly locate colleagues best placed to answer any related queries they have. High-performing organizations are consistently excellent at the first-impression process of on-boarding - be that new staff or new clients. Method Grid expedites the time it takes for new staff to become effective - and - supports their continuous professional development in your firm's unique way of working. Method Grid also enables a professionally-consistent client on-boarding journey. As Director of People and Culture, I am constantly working to recruit top talent for Pi and subsequently supporting new joiners in getting up and running quickly through a bespoke, comprehensive on-boarding plan. Aside from being an invaluable resource; the ability to demonstrate our training program on Method Grid has also helped me in the recruitment process. New joiners have shared that this visible attention to professional development was a critical component in their evaluation of us over other career opportunities. corporate playbook. You’re in good company. Grids can intuitively present multiple types of staff resource - methodologies, operating procedures, lesson module libraries etc. Method Grid is not just your home for repeatable best-practice; it is also your solution for workflow management and progress tracking. Make excellence a repeatable practice with Method Grid. Users can track their way through the delivery of procedural instances - step-by-step - with easy-to-use checklists. Set up colour (task-complete) formatting rules to easily monitor your overall grid (procedure) status. Graphical progress drill-downs allow managers to easily track, and support, delivery progress across your organization. Need some content ideas to get you quickly started? Your Method Grid account comes with multiple free grids covering many common business situations - ready for you to bespoke tailor for your own unique circumstances. The Method Grid Store is forever growing with new such grids - so keep your eyes out for new releases that can be easily downloaded into your own account. Built on rock solid web technology including SQL, PHP and JS; Method Grid has security and data integrity at its core. We partner with quality infrastructure partners to ensure 100% availability, solid security features and reliable content backups. All your files and documents are kept in a non-publicly accessible directory and can only be accessed by the registered users in your organization. Areas of our site that collect your information use industry standard secure socket layer encryption (SSL/TLS); the connection to our site is encrypted and authenticated using a strong protocol (TLS 1.2), a strong key exchange (ECDHE_RSA with P-256), and a strong cipher (AES_128_GCM). Any backups we take are also encrypted using GPG. You can download your developed content at any time using our export function. Please contact us to talk through any other data security related requirements. Sign up and start developing your playbook - it’s free!